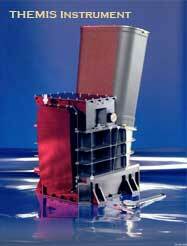 Mars Odyssey launched from Kennedy Space Center on April 7, 2001 and arrived at Mars on October 24, 2001. It spent the next several months achieving a circular mapping orbit by aerobraking (dipping into the atmosphere to slow and shrink the orbit). Aerobraking concluded in early February 2002, and primary mapping operations began a few weeks later. The spacecraft is in a 2-hour orbit around Mars. 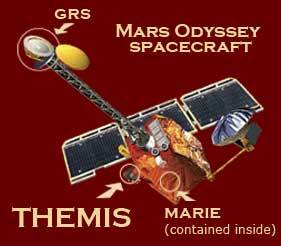 Mars Odyssey carries three main science instruments: The Gamma Ray Spectrometer (GRS), the Thermal Emission Imaging System (THEMIS), and the Mars Radiation Environment Experiment (MARIE). 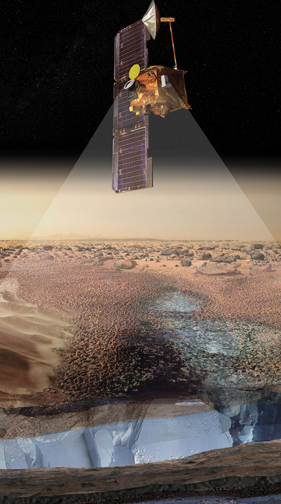 How THEMIS images can help scientists understand the geologic story of Mars. Images of THEMIS and Odyssey during assembly, testing and launch. The who, what, where, why, when, and how of THEMIS. The people responsible for THEMIS and its data, and who are heading the research done with it.